The name "Baia Verde" indicates a small beach, more precisely specifies a beautiful bay, sheltered to the promontory of Capo San Fermo. 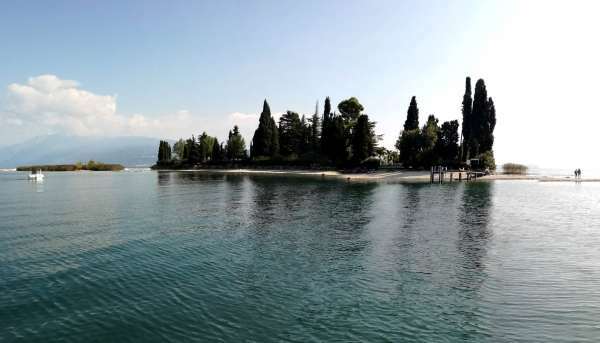 It can be said with certainty that Capo San Fermo is a watershed between the most famous and known "Baia del Vento" and Baia Verde; both are still located in the San Felice del Benaco village on Lake Garda. The main difference lies in reaching these two different areas: If in the case of "Baia del Vento" it is quite simple, through roads available both from Salò and from Manerba del Garda and/or San Felice village; it is not so for Baia Verde because it is not possible to reach it "by road" as it is forbidden by appropriate private properties. Baia Verde is in fact only reachable by boat! This is probably the main reason, which has made it an undeniable and inevitable destination for all boating enthusiasts who are looking for a little quiet and a relaxing break by boat. An ideal and peaceful place to drop the anchor and relax in the sun in a place with a clear water and a blue-greenish hue that give the name of "Baia Verde". The lakebed is not deep (2 or 3 meters at most near the coast) and mooring can be carried out simply and safely. Spending a half day or a few hours in this place to enjoy the sun, or simply for a pleasant refreshing swim will surely be a healthy touch. The view in this area spans 360 ° from Isola del Garda, Monte Baldo and the Sirmione peninsula in the distance, to the nearest island of San Biagio and the Spiaggia della Romantica. It's worth it!